CELEBRATING THEIR VICTORY THAT EVENED THE SERIES. 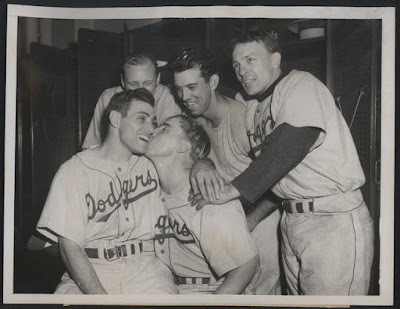 New York--This joyous scene in the Dodgers' dressing room at the Yankee Stadium, shows Al Gionfriddo, (left) whose spectacular catch of Joe DiMaggio's terrific smash into left field saved the game, being kissed Pee Wee Reese, as smiling teammates, Walker, Bragan and Stanky, gather around to congratulate their hero. It was in the sixth inning of today's sixth series game, that Joe went to bat with two men on and blasted a hit the left field fence. Gionfriddo raced right up against the boards to make the catch, and the Dodgers kept their 8 to 5 lead. The Dodgers finally won the game 8-6, to even up the series three all." Via Harold Uhlman at Think Blue LA, "What is the status of the Dodgers MLB scouting?" So what is the status of the Dodgers MLB scouting? Although some of us fear that analytics are taking over in the Dodgers Front Office, that may not be the case. That is, analytics may not trump scouting but just be a tool to use to gather information on players to complement scouting reports. Certainly an expectation is that the current foray into international scouting will continue and intensify and that more importance may well be placed on advance scouting. ICYMI: Via Ken Gurnick at MLB.com, "Seager to miss 1-2 weeks with knee sprain." "It's nothing long term," Friedman said. "As soon as he's asymptomatic, he'll be back. A week or two. There's no tear, there's no surgery, nothing more than treating and waiting until he's asymptomatic and getting him back on the field. He was still feeling sore, but after we checked and we're confident it's nothing that will linger long term." Via Barry M. Bloom at MLB.com, "Maeda to stake claim among Japanese arms." "He's going to fit in very nicely," Roberts said. "For him to be in his prime, he's excited to be here and we're excited to have him. All we want is for him to be himself. He can't be Hideo or Kuroda and Kazuhisa. He has to be himself and that's all we want." Via Bill Plunkett at the OC Register, "Trayce Thompson striking out on his own with Dodgers." “Ever since T-ball, I couldn’t get him to put a bat down,” says Trayce’s father, Mychal Thompson. “Like my other sons, he played all sports growing up. But even during football and basketball seasons, between those games he’d be outside pretending to be a major leaguer. He was always swinging a bat.